Codling moth belongs to the family Tortricidae. This is one of the largest families of moths, with about 950 North American species. It includes a number of important tree fruit pests, e.g., codling moth, oriental fruit moth and several species of leafrollers. These moths are small, usually gray or brown, and their wings have bands or mottled areas. The front wings are usually square tipped. While at rest, these moths hold their wings roof-like over the body. Codling moth originated in Asia Minor but has been a principal pest of apple and pear in North America for more than 200 years. With the exception of Japan and part of mainland Asia, it is found wherever apples are grown throughout the temperate regions of the world. Codling moth larvae bore deep into the fruit, making it unmarketable. If uncontrolled, codling moth can destroy most of the crop. By the first half of the 20th century, the codling moth was a major pest in all apple growing districts of North America. It was not until synthetic organic insecticides became available in the late 1940s that the codling moth could be maintained at very low levels in commercial orchards. Codling moth prefers apple but also attacks pear, large-fruited hawthorn and quince. In California, races of codling moth attack prune and walnut. Pears have some natural resistance to attack by codling moth when fruit are small because of their hardness, however, pears can become heavily infested in late summer as they mature. 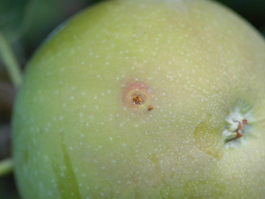 Infestations in stone fruits such as apricot and cherry are extremely rare and usually occur only where heavy infestations of apple or pear are nearby. The codling moth egg is oval, flat and, when first laid, almost transparent. It is about 1/12-inch (2 mm) long. Eggs are laid individually on leaves or fruit and are very difficult to find, especially in a commercial orchard. The newly hatched larva is only about 1/10 inch (2 to 3 mm) long. Its head is black, and the body is creamy white. The full grown larva is 1/2 to 3/4 inch (12 to 20 mm) long, has a brown or black head capsule and thoracic shield. The body is usually creamy white but turns slightly pink when mature. 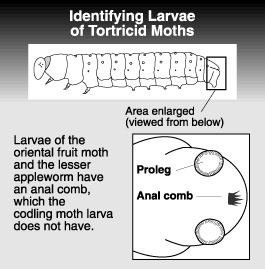 Unlike other caterpillar larvae that feed on the flesh of the fruit, such as oriental fruit moth and lesser apple worm, the codling moth larva burrows through the flesh and feeds primarily on seeds. When mature the codling moth larvae exits the fruit and searches for a sheltered location on the tree or at the base of the tree and spins a cocoon. 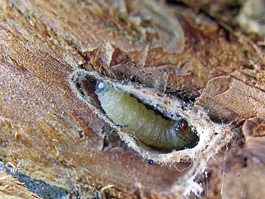 The codling moth pupa is brown and about 1/2 inch (12 mm) long. It resides inside a cocoon spun by the mature larva on the tree beneath bark scales or in a sheltered place at the base of the tree. The adult codling moth is about 1/2 inch (12 mm) long. At first glance, it seems a nondescript dull gray, but closer inspection shows the wings are crossed with fine alternating gray and light-colored bands. The wings are tipped by a patch of bronze-colored scales that reflect in sunlight. The moth holds its wings tent-like over its body when at rest. 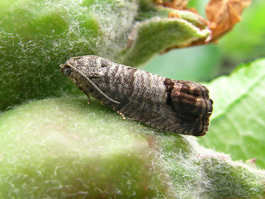 The codling moth spends the winter as a mature larva in a cocoon. Larvae are found under loose bark scales on the tree, in litter at the base of the tree, in wood piles, on picking bins in the orchard or on farm buildings near packing sheds where culled apples might have been dumped. Overwintering larvae begin changing into pupae early in the spring prior to the opening of blossoms. The first adult moths begin to emerge around the time of full bloom of Red Delicious. Peak emergence is usually 17 to 21 days later, though this depends on temperature. Adults continue to emerge for 6 or 7 weeks. Moths are most active on warm evenings, but are inactive at temperatures below 60 °F. Moths mate and begin laying eggs within a day of emerging. First generation eggs are laid primarily on leaves, although some may be found on fruit. Eggs require 8 to 14 days to incubate. 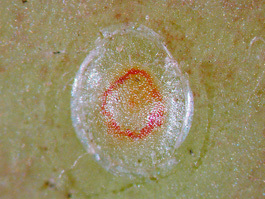 Newly hatched larvae find fruit and enter either at the calyx end or through the side. They bore through the skin and feed on the fruit flesh for a few days, then move towards the apple core where they feed on seeds and flesh surrounding the seeds. As they feed, they push excrement out of the apple through an entry hole, which is gradually enlarged and often serves as an exit hole. Larvae are fully grown in three to four weeks, at which time they leave the fruit in search of sheltered places to spin cocoons. In our region, most larvae pupate and, in two to three weeks, emerge as second-generation adults. However, a small percentage of first generation larvae enter diapause, a state of arrested development, and do not emerge as adults until the following spring. Second generation adults usually begin emerging in early July. Adult activity peaks in mid-July to early August and continues into early September. Second generation larvae are in the fruit from mid-July until late September. Mature larvae of the second generation leave fruit as early as mid-August in search of overwintering sites. It has become more common to have a third codling moth generation and, in exceptionally warm years, a partial fourth generation. Moths representing a third flight emerge in late August or early September and deposit eggs. While larvae of the third generation enter fruit, causing severe levels of crop loss in some instances, most do not complete development before winter conditions arrive or fruit is harvested. Injury is caused when larvae feed on fruit. There are two types of damage: stings and deep entries. Stings are shallow entries where a larva burrows into the flesh and then dies or a larva briefly feeds at a location then abandons that site and moves to another location. On more mature fruit, apple or pear, a reddish colored ring often forms around a new entry or sting. 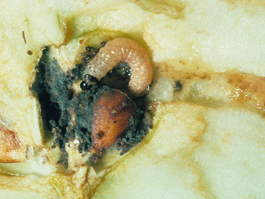 Deep entries occur when a larva bores through the flesh of the fruit, eventually arriving at the center of the apple or pear where it feeds primarily on seeds. Deep entries are often characterized by brown frass, or excrement, extruding from an enlarge entry hole or a new hole destined to as an exit for the mature larva. 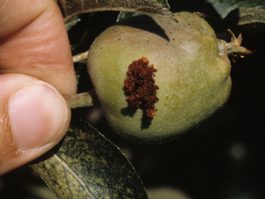 In pear, deep entries are most often noticed when frass appears at the calyx end of the fruit. 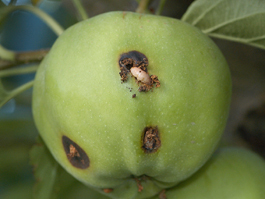 Both types of damage make fruit unmarketable, but deep entries are a problem in stored fruit because bacteria and fungi associated with the entries enhances fruit rot. Pheromone traps can be used to monitor adult activity. Traps should be placed in the orchard by the pink stage of apple flower-bud development. Traps should be examined frequently until first moths are captured and then weekly thereafter. Trap placement and maintenance are critical to obtaining reliable information on which to make management decisions. Traps should be placed in the top 1/3rd of the tree within the canopy, making sure the entrance to the trap is not blocked. There are various types of traps but the most common one used over the past decade is the delta-type. This trap provides efficient capture of moths and is made of durable materials that maintains its shape throughout the season. In most traps an insert with a sticky surface is where moths are captured. Some inserts are coated with a sticky adhesive that requires stirring occasionally to maintain its effectiveness in capturing moths. Other inserts have a dry adhesive that does not require stirring. Both types of inserts should be changed if they become contaminated with dust or other debris. There are several different lures that can be used to monitor codling moth adult activity. Most apple orchards in Washington are treated with pheromone mating disruption products and in these orchards a “high-load” pheromone lure, or a lure containing pheromone plus a non-pheromone component, such as pear ester, should be used. The lure used in a trap should be changed on the interval recommended by the company providing the product. To assess codling moth damage, examine fruit at the end of the first generation, in early July, and again before harvest. A visual inspection of fruit viewing half of 30 to 40 fruit from least 40 trees, or in high-density orchards at 40 locations, for every 10 acres. Most fruit damage typically occurs in the upper half of trees, so sampling this region is critical. Some growers, especially organic growers, have banded trees with cardboard strips as a means of monitoring presence and density of codling moth and as part of a control program. Mature larvae migrating down the tree in search of shelters to spin cocoons enter these bands. Bands can be removed and examined after the first generation or after harvest. If the intent is to estimate the codling moth population, banding 40 trees per 10-acre block is recommended. This technique is much more efficient on young trees with smooth bark. On older trees, the bark should be scraped smooth and the bands attached at the scraped area to enhance capture of larvae. Estimating the population level of codling moth in commercial orchards is challenging. Visual observation of fruit injury can provide valuable information about the level and distribution of codling moth in an orchard. See the discussion above for information on this method. If fruit injury monitoring reveals injury levels of 0.5% or more then increased controls should be implemented. Capture of codling moth adults in pheromone traps can be used to estimate population levels and help make control decisions. The number of traps used, their location, trap maintenance and the quality of the pheromone trap are all critical elements to the successful use in a threshold-based decision program. To implement a threshold-based decision program it is essential to use one monitoring trap for every 2.5 acres. Traps should be placed in the orchard before the accumulation of 175 degree-days (or at the pink stage of apple bud development). Trap placement within the orchard and tree will influence moth captures. Avoid placing traps at the very edge of a block. It is best to place a trap in the center of each 2.5 acre section to be monitored, however, traps may be placed toward an outside border that is impacted by known history of pest high pressure. See the discussion above regarding the kind of traps and lures to be used in monitoring codling moth adults. Traps should be checked once a week after the first moths are caught. After a total of 30 moths have been captured, or if the trapping surface becomes dirty, the trap bottom or insert should be replaced. Count the number of moths in each trap and remove moths. Record the catch separately for each trap. The idea behind using trap catch as a treatment threshold is that sprays are applied only when moth catch exceeds certain number, the capture threshold. Two threshold methods can be used with moth capture data. With the first method, the trap catch threshold is 2 moths captured on two consecutive weeks. Thus, if a trap catches 2 moths one week and 2 or more the next, a treatment should be applied to the area associated with the trap (2.5 acres). However, if a trap catches 2 moths, then 1 moth, then 2 moths, a spray is not recommended. This method has worked well for growers in British Columbia and Washington. With the second method, the codling moth degree-day model is incorporated with moth capture in pheromone traps. The same density of traps is used, one trap every 2.5 acres. Moth capture in a trap is accumulated between 175 to 425 degree-days. The recommended treatment threshold is a total 5 moths, so if 6 or more moths have been captured, then the area associated with the trap should be treated at the 425 degree-day timing. If a treatment is justified based on accumulated moth captures, then moth capture accumulation is started over for the next time period, based either on the expected residue of the pesticide or over the next 250 degree-days. Where codling moth populations are low, it may be possible to delay the treatment decision until 525 degree-days. If by 525 degree-days the moth capture threshold has not been exceeded, then a control treatment should not be applied. If the threshold is exceeded, apply a control treatment as soon as possible. Then moth capture accumulation is started over for the next time period, based either on the expected residue of the pesticide or over the next 250 degree-days. For the second generation and beyond, the moth capture treatment threshold is reduced to an accumulation of 3 moths, because capture efficiency of pheromone traps is reduced in this time period. Start accumulating moth catch at 1175 degree-days. If 4 or more moths are captured over the next 250 degree-days, a control treatment should be applied to the area associated with the trap. If moth captures do not exceed 3 moths, a control treatment should not be necessary, and the accumulation of moth catch from zero again. Caution: Control treatments should be applied to the part of the orchard represented by moth capture in the trap that has exceeded the treatment threshold. However, depending on how the orchard is designed, an area larger than that represented by an individual trap may need to be treated. The use of treatment thresholds based on codling moth capture in pheromone traps usually reduces use of insecticides. The treatment thresholds recommended above should only be applied to the individual trap associated with 2.5 acres and should not be used as a threshold based on an average moth capture over the entire orchard. If trap densities are less than on every 2.5 acres, for example one trap per 5 or 10 acres, then the thresholds described above are not applicable and if used could result in unacceptable crop loss. The codling moth has several natural enemies, however, it is impractical to rely solely upon them to suppress codling moth populations to levels that would result in acceptable crop protection. Most conventional insecticides are toxic to the natural enemies of codling moth. Where mating disruption or soft insecticides are implemented, natural enemies, especially parasites, can be an important component of the pest management program. Trichogramma sp. are parasites that attack codling moth eggs. These small wasps can parasitize a high percentage of eggs under favorable conditions. Another parasite, Ascogaster quadridentata, was introduced to the United States from France as a biological control for codling moth. This wasp deposits an egg in the codling moth egg, but it does not kill the codling moth until the larva is nearly full grown. Insects are cold-blooded animals and thus how fast they develop from egg to adult is driven by the temperatures they are exposed to. Degree-day models, that accurately predict the development of insects, have been used for several insects, including the codling moth. Since the early 1980s the codling moth degree-day model has been used to more precisely time insecticide applications. In the past, a biological event, the first capture of codling moth adults in a pheromone trap, has been used to initiate the accumulation of degree-days. This biological event was referred to as the “biofix,” because it represented a biological fix point to initiated the codling moth model. 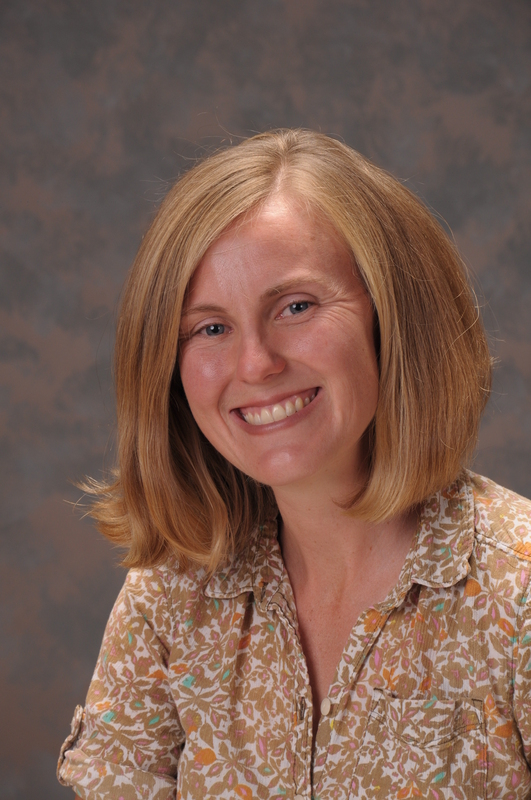 Establishing a biofix for codling moth was a challenge in many orchards, therefore, WSU scientists developed a no-biofix model that accurately predicts the development of codling moth by accumulating degree-days from January 1 of each year. On average, the first emergence of codling moth adults starts at 175 (°F) degree days from January 1, so there is no need to use moth capture in pheromone traps to initiate the accumulation of degree-days. In the past, the degree-day total was set to 0 when the biofix, first moth capture, was determined. However, with the no-biofix model degree-days there is no reset of degree-days to zero. Timing of pesticide treatments depends on the life stage targeted. 225 degree timing: The first target is the codling moth eggs. Eggs begin to be deposited between 225-275 degree-days. It is possible to apply insecticides, referred to as residual ovicides, between the 225-275 degree-day period. These insecticides kill codling moth eggs that were deposited on top of residues. Some insecticides applied at this time will also kill leafroller larvae that are present in the orchard. Delayed first cover timing: It is also possible to apply horticultural oil at 375 degree-days, a treatment that kills codling moth eggs already deposited. Horticultural mineral oil is referred to as a topical ovicide. If a residual ovicide or oil is applied as outlined above, then the next time to apply an insecticide would be at 525 degree-days. This timing if often referred to as a delayed first cover spray, which targets codling moth larvae hatching from eggs. If no residual or topical ovicides are applied in the 225-275 or 375 degree-day timings, respectively, then insecticides should be applied at 425 degree-days, which targets the beginning of codling moth egg hatch period. Repeat applications of insecticides in the first codling moth generation should be based on the need to suppress the pest population. The interval between successive insecticide treatments should be determined by the length of the active residue of the insecticide used. Timing for the second codling moth generation should also be based on degree-day accumulations. Moths of the second generation will being emerging at 1175 degree-days and first egg hatch will begin at 1400 degree-days. Control timing strategies used in the first generation can be applied in the second generation. The best way to utilize the codling moth model is to access the WSU Decision Aid System (www.decisionaid.systems). This computer based system automatically updates the codling moth model but it also provides management guidelines and is linked to the pesticide recommendations found in the WSU Crop Protection Guide for Tree Fruit – EB0419. 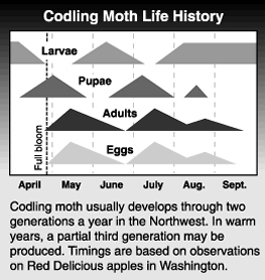 Mating disruption is a standard control for codling moth applied to roughly 90% of apple acres in Washington. Pheromones applied in orchards work to disrupt or delay the ability of male codling moth to locate and mate with females, resulting in a reduction of viable offspring. The term ‘mating disruption’ is often associated with this control technique. Pheromone mating disruption has been shown to significantly reduce the amount of insecticides required to control codling moth in apple orchards. There are several different kinds of dispensers utilized to deliver codling moth pheromone in orchards. For many years the hand-applied dispensers were the most common pheromone delivery system. However, aerosol emitter technologies has become more common as a method of delivering codling moth pheromone in orchards. Pheromone dispensers should be placed in the orchard prior to the first moth flight in spring. The number of dispensers applied per area depends on the type of product used. Placement of dispensers should be in the upper third of the tree canopy. Control of codling moth in organic orchards is impossible without the use of pheromones (mating disruption). However, pheromones alone are often insufficient to provide adequate crop protection, thus supplemental pesticides applications are usually needed. The number and kinds of organic pesticides for codling moth control are very limited. The codling moth virus and horticultural oil are effective organic insecticide, but they have to be applied frequently. These two insecticides are best used together as a tank mix application. The insecticide Entrust (spinosad) is also an effective organic insecticide, but the number of applications per season is restricted by the label. Other botanical and biological insecticides have not been effective at controlling codling moth in organic orchards. Articles from the Tree Fruit website may only be republished with prior author permission © Washington State University. Reprint articles with permission must include: Originally published by Washington State Tree Fruit Extension Fruit Matters at treefruit.wsu.edu and a link to the original article.